Air conditioners are far more than a luxury in Southern California, especially in the foothill communities where temperatures can hit triple digits well past Labor Day. We never anticipate a sudden, unexpected breakdown in an air conditioner, but when it comes, you need to get it dealt with fast before your home feels as hot and unpleasant as the outside air does. Moreover, such breakdowns don’t always occur during normal office hours. When they happen in the middle of the night or over the weekend, you may need an emergency repair call to take care of it. That means finding an air conditioning repair service that makes emergency calls to move quickly regardless of the time of day. But it also means knowing when a given call is an emergency and when you can wait it out until a regularly scheduled appointment can be made. Ultimately, only the homeowner can decide when an emergency call is warranted. However, there are some key questions you can ask to help make that decision: saving you money if you don’t need emergency service or emphasizing the immediate nature of the problem if you do. Can You Go Without AC Until Regular Hours? Evenings are usually quite cool, and if your air conditioner breaks down in the middle of the night, you may be able to keep comfortable simply by opening the windows of the home and running your fan. That might not be possible on the warmest nights, however, and it could be further compounded by your immediate needs (such as the need to get a good night’s sleep in comfort before a big day at work or the like). That may get even worse if the breakdown takes place on a weekend, with days to go until regular business hours. In those cases, an emergency call may be necessary just to avoid having to suffer for that long. Are There Sensitive Members of Your Family? Family sensitivity to high heat can make a big difference in whether you need an emergency service or not. Infants and the elderly, for instance, are more vulnerable to excessive heat, which could create a health risk if they go without air conditioning for extended periods of time. Again, this can be compounded by the nature of your home as well. A home which stays naturally cool or can be cooled by opening the windows may not present an active health hazard the way a more confined home might. If it doesn’t, then you may want to consider an emergency repair session. You should never attempt to diagnose or repair a faulty air conditioner yourself – it requires proper licensing and training to do so safely. 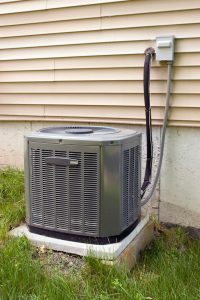 Nor should you attempt to run an air conditioner exhibiting signs of damage: you’ll likely only make the damage worse and increase the cost of repairs. But in some cases, the damage may be localized, particularly in the case of ductless air conditioners which uses multiple smaller units instead of one big one. If this is the case, you can probably turn off power to the affected section can wait for regular hours. For emergency AC repair in Pasadena, CA, call Greenleaf Heating & Cooling today!